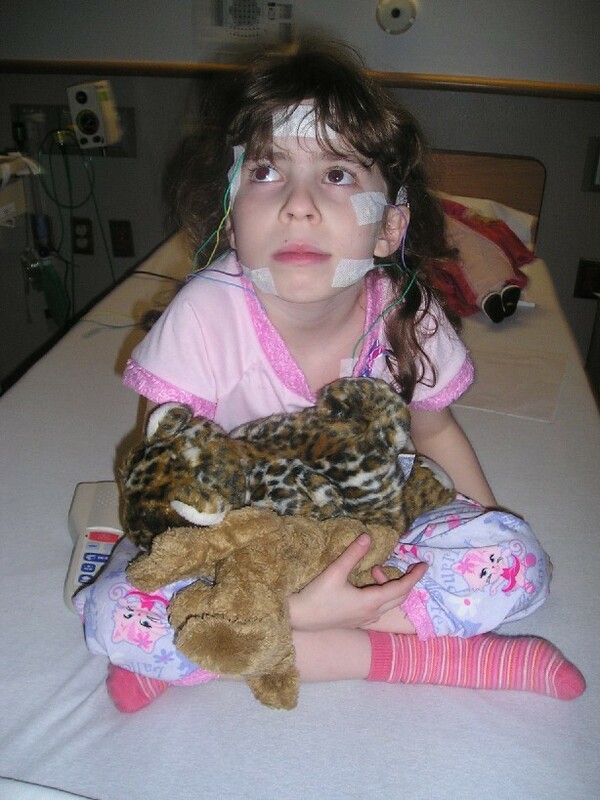 This was Julie's second sleep study. Her first was at age 4 and was essentially normal. The only findings on that study were that her oxygen saturation dropped between 90% and 95% 9% of the night--more than you usually see in a child, but still "normal"--and that she has frequent arousals and awakenings on the study which was considered a study artifact. In other words, she woke up a lot because she was sleeping away from home with two dozen wires attached to her body! This study was done because Julie has been waking up tired with back pain more days than not and increasingly for 6 months. She does not have morning headaches which is most typical of sleep apnea, but there are other possibilities for interrupted sleep. 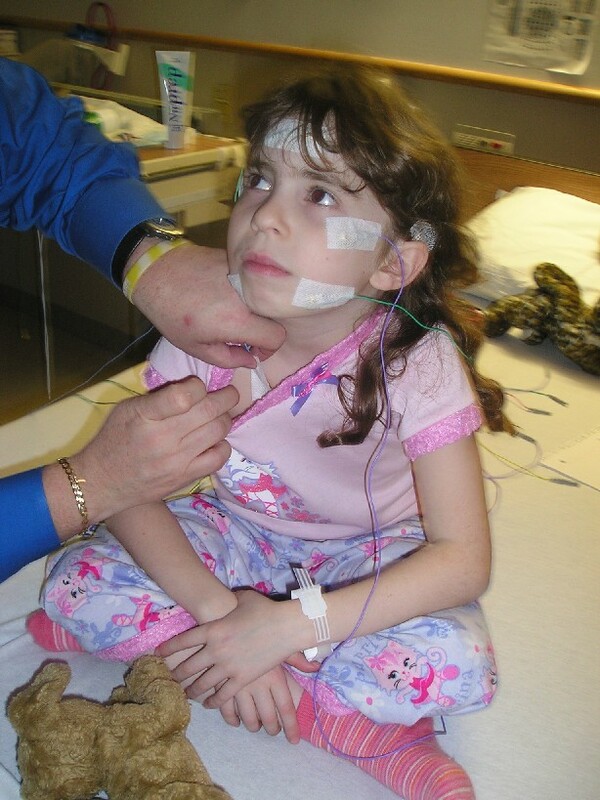 For a child with a neuromuscular disorder, a sleep study is the best way to monitor her breathing status. Any issues with breathing show up during sleep first because the muscles that might help you compensate during the day are not helping when you are asleep. Julie just had her first full battery of PFTs (pulmonary function tests) and her airways are nice and open, but her respiratory muscle force is "moderately" weak. Her breathing in and breathing out respiratory muscle force numbers were 43 and 30 (I think breathing out was higher, but I'm not certain) and you want to see numbers of at least 60. This was an eye opener for me and her dad because it explains why she can't blow her nose! She can't muster enough respiratory force to do so. Otherwise, it does not appear that this "moderately weak" respiratory muscle force affects her daytime breathing. This sleep study will show whether it affects her nighttime breathing at all. The process of getting wired up for the sleep study was painless for Julie, but long and tedious. I bought her a new DVD of the Muppet Movie to help her pass the time. One of the main things she remembers from her first sleep study at age 4 was that I bought her a new video! 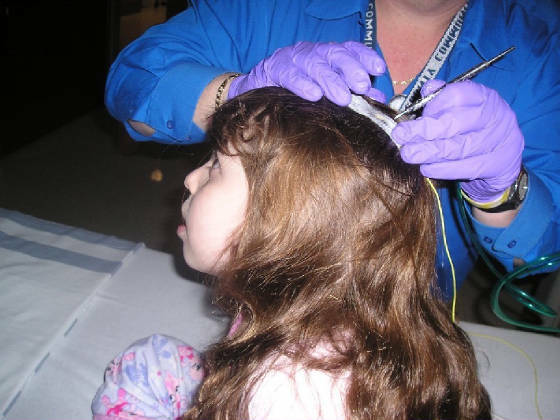 The wiring process begins with EEG electrodes on her scalp. The tech used special glue to make them stick and covered each electrode with gauze and the glue, then used a pointy metal thing that blew forceful cool air to help the glue dry and adhere quickly. Not painful at all, but the cool air did give Julie goosebumps! At the start, Julie is relaxed and ready. It's about 7:30pm in this picture. The tech is using that forced air thingie to dry the glue. This doesn't hurt at all! The new look for 2006! 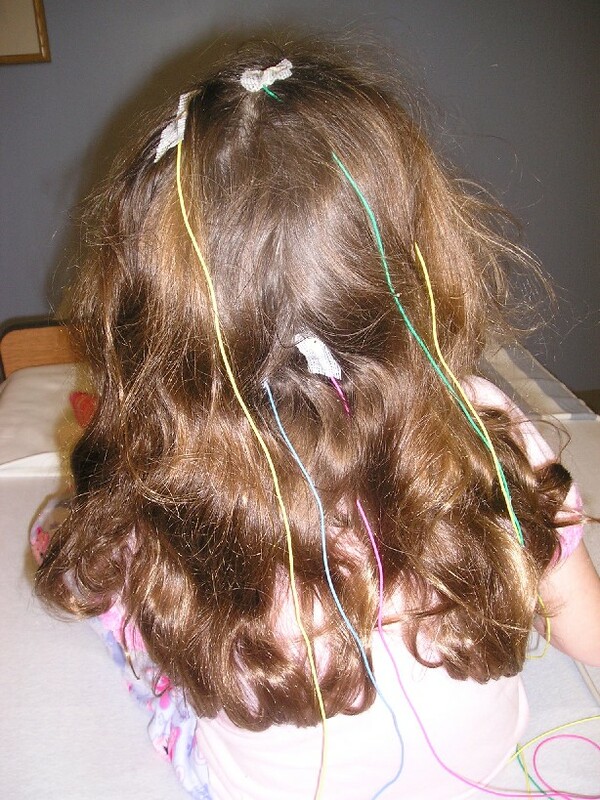 EEG electrodes! Julie now EEG electrodes on her face and is getting two EKG electrodes on her chest. The electrodes on Julie's skin only take a little goo to make good contact and then a piece of tape to hold them in place. Much less complicated than the ones in her hair! Julie got to see herself in the mirror and said "I look like Patch Girl!"